Guinea Hogs have a gestation (pregnancy) averaging about 114 days. Some farmers call it “three months, three weeks and 3 days” and others are even more general in their figuring by merely rough estimating slightly less than 4 months. Piglets are born about the size of a soda pop can with legs; about 1 pound. They grow quickly and by weaning time at around 5 to 8 weeks are about the size of a 3-liter bottle of soda pop; about 9 or 10 lbs. At this time they can be easily shipped in a cat carrier via air freight (outer dimensions approximately 15″ x 23″), or 2 at a time in a slightly larger pet crate. Unlike commercial pig operations, many Guinea Hogs breeders do not use worming anthelmintics, vaccinations, do not cut the eye teeth nor do the inhumane tail docking. Castration of male pigs can be done if desired, which is easiest done at about 14 days of age. Males can breed as early as approximately 6 to 8 months of age. 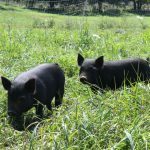 Gilts (young females) can come into their first heat (estrus cycle) as early as 8 months of age. When exposed to a male, females can farrow (give birth) near or shortly after their first birthday. When exposed to a male, Guinea Hog sows can have 2 to 2.5 litters per year, with 2 being the most common. Litter size can range from 1 to 14, with 6 being the most common. What age to butcher? This depends on what you want. Butchering is easiest in winter, and may play an important part at what age you butcher. 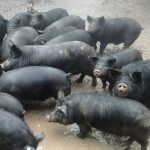 By 6 months of age, you might have a 60 lb pig with a 50% carcass weight, and by 1 year of age you may have a pig about 120 lbs with approximately 60 lbs carcass weight. While they reach sexual maturity earlier, Guinea Hogs will reach their full size at about 2 or 3 years of age, topping out at approximately 200 to 300 lbs. Guinea Hogs can live a fairly long time, with some alive today at age 13 or 14, and possibly older. 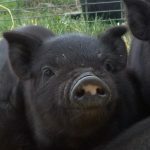 If females are not bred (exposed to a boar) within the first year or two, it is more than likely that she will never bear young, especially if she is obese. 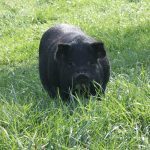 There are several adult Guinea hogs that owners have been hoping to breed in order to add to the limited gene pool, but because these girls were not bred earlier in their careers, they have not yet been able to conceive. Whether you want to continue breeding is up to you, but it is advisable to breed your girls earlier rather than later, so that they are adding to the gene pool. 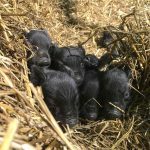 Some breeders advise to not just breed them once per year, but do it twice per year to keep them cycling, otherwise they may stop altogether before their time.